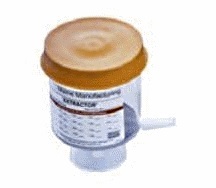 The Ethidium Bromide Waste Reduction Extractor System is a one-step self-contained filtration funnel device for the rapid removal of ethidium bromide (EtBr) from gel-staining solutions. This disposable unit contains an activated carbon matrix that removes at least 99% of ethidium bromide from electrophoretic buffer quickly and easily. Each device can decontaminate up to 10 liters of gel staining solution. After filtration, the decontaminated solution (assuming no other hazardous components) can be safely disposed of in the laboratory drain (usual laboratory procedures would call for a UV check of the solution to make sure it no longer fluoresces). The filter is disposed of at the end of its life by placing in a sealed plastic bag and adding the bag to a properly labeled hazardous waste container. 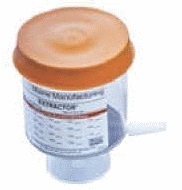 The Extractor funnel device fits most standard laboratory flasks and bottles with neck size 33-45 mm, and the unit includes a cap for storage between uses and an adhesive label. The polypropylene housing is chemically resistant to organics. Also included in the package are glass fiber prefilters that remove gel pieces and other debris to avoid premature clogging of the carbon filter.